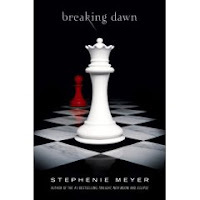 Have you seen the new cover for Breaking Dawn? Speaking of things that intrigue me, Lisa's got a rather intriguing post up: What Would You Buy with $50K? A friend of hers has $50,000 to buy materials for a new elementary school library. Head over to Lisa's blog to check out Lisa's list and add your own suggestions. And I'd like to point out a blog that I've recently discovered and love. The Crafty Crow is a great, great collection of children's craft ideas. It's updated very frequently with craft ideas for all ages. Each post contains a photo of the craft in question and a link to the instructions. I've already bookmarked a whole bunch of posts with crafts I might use for our fall session of After School Adventures. The posts are all tagged with age groups and may other helpful tags which makes the site a really valuable resource. If you're a crafty librarian or a non-crafty librarian in desperate need of easy, interesting crafts (*raises hand*), you won't want to miss this site. Happy Saturday, everyone! My parents are in town, so I'm off to the city for lunch and a show!